Billed as volume four of a "Igor Shukow Edition", I can't imagine what the market for this disc is. Let's be brief. 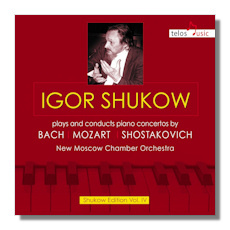 Shukow is little known outside Russia, but seems respected as both pianist and conductor. As evidenced here, his repertoire is appreciably diverse, and he seems to be adaptable to the various stylistic demands of the music he chooses. He is credited as the founder of the New Moscow Chamber Orchestra, and the booklet notes his 11 year tenure there are reputation in his home country. Internationally, he has been more elusive, though he's probably known better among fellow piano players. I refuse to believe that this disc of live recordings draws from 2014 concerts, and am more willing to bet these date from 1983-1994, when Shukow was leading his orchestra full time. The booklet doesn't say, but does give his birth date as 1936, which reinforces my opinion that these are somewhat older recordings. If they aren't, good for him. He plays very well. The Shostakovich goes best; indeed it might be worth having the disc for this fine performance alone. The trumpet soloist is not given any credit, which is absurd in a concerto for piano and trumpet. Still, I like the nervous energy here. But aside from the bad liner notes, there is a major issue with this release. The New Moscow Chamber Orchestra is simply horrible. I like their sound initially in the Shostakovich, especially given the conception from the soloist. Here, a little roughness is acceptable. Later, the aural picture sours noticeably. In Mozart and Bach, it's fatal. K. 488 suffers from a total lack of tonal polish and almost no imagination. The Bach is both heavy and unattractive. Piano fans might want this as a study disc or memento, but overall the value here is poor. Naxos is distributing this in case you want it, but I can wager that you probably don't.